February 17, 2016, marks the 37th anniversary of the Communist Chinese invasion of Vietnam – the 1979 Sino-Vietnamese War. In Communist China, as in the rest of the world, it will be ignored. Map by Ceresnet, wikimedia commons. In Vietnam, the communist government will not focus much attention on the anniversary, but many of the Vietnamese people that reside in the northernmost provinces will commemorate the day with visits to the graves of family members that died during the 1979 Chinese invasion. In the West, the Sino-Vietnamese War is largely misunderstood or simply forgotten. The most obvious question is, “Why did it happen?” How is it that fraternal communist states managed to go to war with each other in the midst of the Cold War between communist and capitalist nations? The first part of the answer is that many fraternal communist states were not as “fraternal” as they wanted the world to believe. Vietnam and Communist China had never had warm relations. Vietnam saw its powerful neighbor to the north as a constant threat to its security and was leery of Chinese military assistance during the French-Indochinese War. The USSR and Communist China had also failed to realize anything like “fraternal warmth” and were occasionally involved in military skirmishes along their shared border. As the French-Indochinese War played out, the USSR and communist North Vietnam developed close relations. The USSR was the main provider of military and economic aid to North Vietnam. That close relationship continued during the American-Indochinese War. 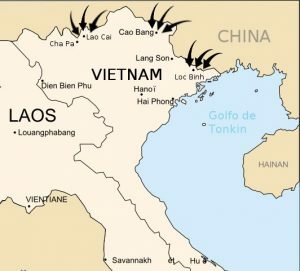 When the US abandoned Vietnam, the communist Vietnamese government wanted to consolidate communist revolutions in Laos and Cambodia under Vietnamese hegemony with support from, and allegiance to, the USSR. The Vietnamese viewed this as the most obvious strategy for keeping China out of Southeast Asia. Unfortunately for Vietnam, China had its own plans for Southeast Asia. Modern Communist Chinese are fond of portraying themselves as being something like a neutral and peace-loving country. They are quick to claim that they have never “exported revolution.” The inference is that, while the Soviets pursued imperialist aims, China was busy experiencing a joyous cultural revolution and building a better workers’ paradise. The reality was that, unlike the USSR, Communist China was simply unable to realize its own imperialist aspirations. That didn’t keep them from trying. While the communists in Vietnam were dealing with the US in South Vietnam, the Chinese were building a Chinese-aligned communist regime in Cambodia. In 1975, with the help of China, genocidal maniac leader of the Khmer Rouge communist movement, Pol Pot, came to power in Cambodia. He renamed Cambodia “Kampuchea.” Pol Pot consolidated his position, and, assured of full support from China, he cut off relations with the communist regime in Hanoi. 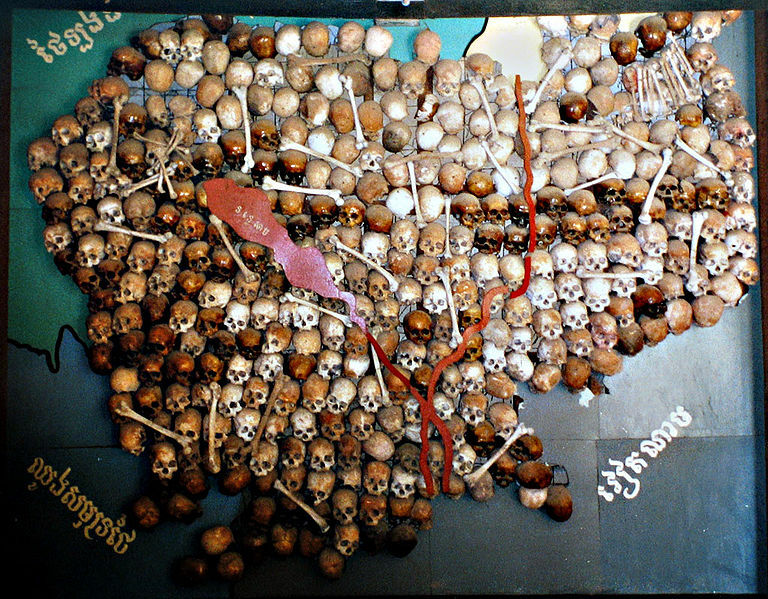 Made with 300 skulls of Pol Pot’s victims to memorialize over 1 mil murdered. Image by Donovan Gavan, wikimedia commons. In 1976, the ruthless Communist Chinese dictator, Mao Zedong, finally succeeded in doing something positive for China. He died. When the dust settled, a new and vastly more effective oligarchy led by Deng Xiaoping rose to power in Communist China. Deng had a better grip on reality than Mao ever had. He and his supporters grasped the concept of China as a big country in a bigger world. Deng was more concerned by Soviet aggression. On the surface, his regime had to maintain a veneer of good old-fashioned communist hatred for capitalist demons, but in practice, they quickly began to emulate those “capitalist demons.” Deng was not in love with capitalist philosophy. He simply admired capitalist results and wanted to improve China’s pathetic economy. Deng and his supporters were either unwilling or unable to substantially improve relations with the USSR and they quietly made overtures to the US. Communist China’s continued support for the Pol Pot regime would seem inconsistent with the modernizations and limited liberalizations that were being implemented at home. 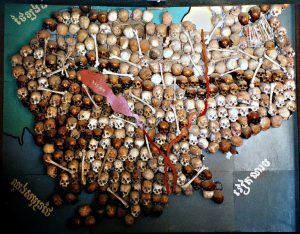 However, Deng chose to ignore the Khmer Rouge’s genocidal conduct because they were the one non-Soviet-controlled option in Cambodia. In 1978, with the “filthy American imperialist dogs” gone and the South Vietnamese government vanquished, the Vietnamese decided to try their own hand at a bit of fun-filled filthy imperialism. They invaded Cambodia. The USSR provided financial and military support for the operation. The Chinese were infuriated. They responded by reinforcing their military along their border with the USSR. In 1979, much of the Vietnamese Army was in Cambodia chasing down Khmer Rouge forces and trying to install a Vietnamese-controlled government. Deng’s military leaders decided that the time was ripe to invade Vietnam. The Communist Chinese military leadership correctly predicted that the USSR would not attempt to invade or attack China, because the USSR needed to maintain its military focus against well-equipped NATO forces in Europe. The Communist Chinese military incorrectly predicted that Vietnam would quickly recall all of its troops from Cambodia to defend the motherland from the Chinese invasion, and that this would save the Khmer Rouge. 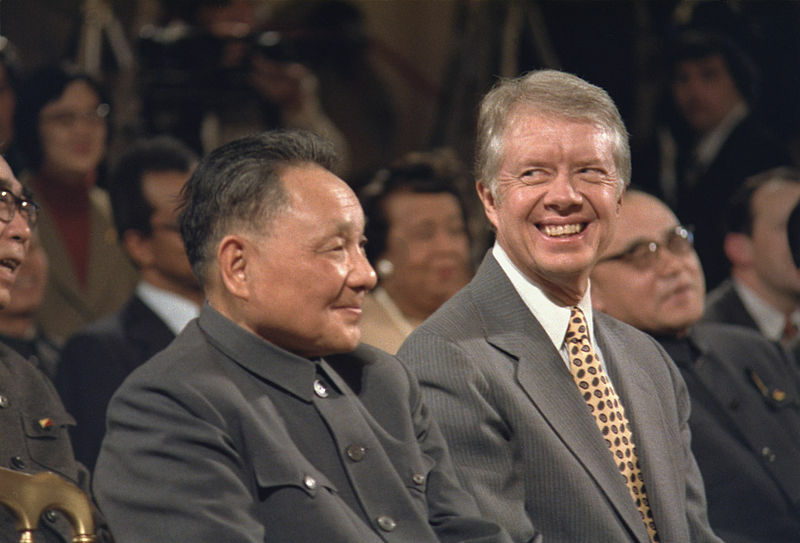 While visiting the US in January of 1979, Deng Xiaoping told American President Jimmy Carter that, “The little child is getting naughty; it’s time he be spanked.” It was not a bluff. Image Nat’l Archives & Records, public domain. On February 17, 1979, Communist China invaded Vietnam. The details of that war, as with all wars, depend on whom you ask. The Vietnamese version of the story is that 600,000 of China’s best troops invaded Vietnam and raped, pillaged, and murdered women and children. Due to the superiority of the courageous Vietnamese local militia forces, the cowardly Chinese suffered massive casualties and were forced to retreat. The Chinese version of the story differs a bit. They invaded politely with about 200,000 troops, quickly vanquished the Vietnamese, and, although the path to Hanoi was open, chose to be magnanimous in victory and withdrew from Vietnam. The truth is that Communist China did mobilize 600,000 troops in Southern China, but only 200,000 crossed the border. Thanks to Soviet satellite imagery, the Vietnamese calculated that the Chinese lacked the required strength and logistical support to actually attack Hanoi. The Vietnamese did not withdraw all of their forces from Cambodia, and the Khmer Rouge did not regain control of Cambodia. The Communist Chinese suffered about 6,500 fatalities and perhaps 15,000 wounded. China claimed to have counted 57,000 dead Vietnamese soldiers and 100,000 dead Vietnamese militia members. The Chinese claims are likely wildly exaggerated, but they may have counted the many unarmed Vietnamese civilian casualties as militia. China did not withdraw due to a manpower shortage. It withdrew because it lacked the logistical capability to continue the invasion. On their way home, the Chinese did their best to destroy anything useful in northern Vietnam. China could easily tolerate the casualties in Vietnam, but it could not tolerate the economic costs. By March 16, 1979, China had withdrawn from Vietnam. The Western media coverage of the war was mostly amateurish, somewhat creative, and often inaccurate. They lacked enough sources in the war zone, but that didn’t stop them from making wild assumptions. Many in the media focused on the theory that the US Intelligence Community had “failed completely” in predicting the Chinese invasion. The Intelligence Community hadn’t failed at all. When Deng chatted with President Carter in January 1979, Carter told him that the US was aware of the Chinese mobilizations in progress along the Vietnam border. Deng didn’t deny it. He was frank with President Carter about his intentions. As they usually do, the Western media assumed that, since the CIA had not reported anything to them about the Chinese buildup, it meant the agency was once again blindsided by world events. The media then, as now, was unable to fathom that the Director of the CIA reports to the US President (and now to the Director of National Intelligence) rather than to the Press Corps. What the President decides to tell the media is up to the President. 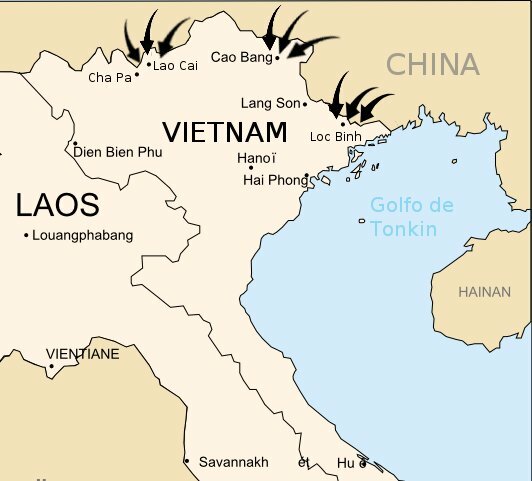 In the aftermath of the war, Vietnam conducted reprisals against non-ethnic Vietnamese that were assumed to have supported the Chinese invasion. Thousands were killed, and tens of thousands were resettled to work camps in southern Vietnam. The economic damage that the Chinese had inflicted had a long-lasting negative impact on the economy of northern Vietnam. For their part, the Chinese instituted a modernization campaign of the military, but that modernization had to wait for the Chinese economy to recuperate from Mao’s highly destructive “cultural revolution.” Only after decades of very profitable trade with capitalist Western nations has that long awaited military modernization finally come to fruition in China. In 1979, the Vietnamese loathed and feared the Chinese. In 2016, they fear the more powerful, modernized Communist China even more. The 1979 Chinese invasion of Vietnam was not the first. It might well not be the last. As always, Jay, you’re my best source of information about the world stage. Hi. David. Thank your kind words. Thanks for the synopsis. I remember when the war broke out, but don’t remember any of the details.